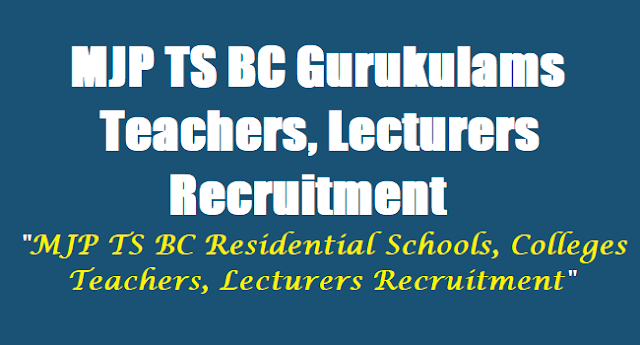 MJP TS BC Gurukulams Teachers, Lecturers Recruitment Results, Selection list 2017 @ mjptbcwreis.cgg.gov.in: MJP TS BC Gurukulams Teachers Recruitment Results, Selection list 2017/ MJP TS BC Gurukulams Junior Lecturers Recruitment Results, Selection list 2017/ MJP TS BC Gurukulams Degree Lecturers Recruitment Results, Selection list 2017/ DEMO for Selection of Guest Lecturers in Residential Junior Colleges/ DEMO for Selection of Guest Lecturers in Residential Degree Colleges: MJP TS BC Residential Schools, Colleges Teachers, Junior Lecturers Recruitment 2017,TS BC Gurukulams Teachers, Junior Lecturers Recruitment 2017,Guest Teachers, Lecturers Recruitment in EM Gurukulam Schools and Colleges,Download the application form of MJPTBCWREIS Teachers, Junior Lecturers Recruitment 2017,Last date to apply for Jyothiba BC Gurukulams Teachers, Junior Lecturers Recruitment 2017,BC Gurukulam Teacher, Junior Lecturer Posts 2017, TS BC Welfare Teachers, Lecturers Recruitment 2017 . Mahtma Jyothiba Phule Telangana Backward Classes Welfare Residential Educational Institutions Society(MJPTBCWREIS) hyderabad has published the Guest Teachers, Lecturers Recruitment for 119 TS BC Residential Schools and 16 Upgraded Junior Colleges for Backward Classes. MJPTBCWREIS invites the application forms from the eligible and interested candidates for recruitment of PGTs, TGTs, PETs, PDs, JLs. Online applications are called for from the eligible candidates for engaging Guest Lecturers in Residential Junior Colleges, for engaging Guest Lecturers in Residential Degree College for Women and for engaging Guest Teachers in Residential Schools. 1. Candidate must have passed PG in relevant subject recognized by UGC with B.Ed. 4. Applicants have to attend objective type written test in their relevant subject at District level (Old Districts). 6. Qualified candidates in written test will be called for DEMO. 7. Candidates will be selected on the basis of merit secured in written test and Demo. 8. The personnel will be engaged on Guest basis only and they can be terminated at any time without assigning reasons and without notice. 9. Remuneration will be paid @ Rs.180/- per period, not exceeding 100 periods in a month (Rs.18,000/-) p.m.
1. Only Woman Candidates are eligible for applying. 2. Candidate must have passed PG in relevant subject recognized by UGC with National Eligibility Test (NET) or SLET. If the candidate possesses Ph.D., is exempted from passing NET or SLET. 9. Remuneration will be paid @ Rs.200/- per period, not exceeding 100 periods in a month (Rs.20,000/-) p.m.
1. Candidate must be a Graduate recognized by UGC with B.Ed. 7. Qualified candidates in written test will be called for DEMO. 8. Candidates will be selected on the basis of merit secured in written test and Demo. 9. The personnel will be engaged on Guest basis only and they can be terminated at any time without assigning reasons and without notice. 10. Remuneration will be paid @ Rs.140/- per period, not exceeding 100 periods in a month (Rs.14,000/-) p.m. Written Test and DEMO. Applicants have to attend objective type written test in their subject at District level on 25-05-2017. Qualified candidates in written test will be called for DEMO, according to merit and requirement. The personnel will be engaged on Guest basis only and they can be terminated at any time without assigning reasons and without notice. Candidates can apply for the above mentioned posts through online mode only at mjptbcwreis.cgg.gov.in or http://mjpabcwreis.cgg.gov.in/ on or before 14-05-2017 OR The format of online application is available in this website. 1. Candidates will be permitted into the examination center 15 minutes before the commencement of examination and will not be allowed to leave the examination hall till the end of the examination. 2. Candidates will not be allowed into the examination hall after the commencement of the test. Principal/any Gazetted Officer and a Xerox copy of the same hall ticket is to be handed over to the invigilator. 4. Using the whitener/blade/eraser or any kind of tampering to change the answer on OMR answer sheet will lead to invalidation. 5. Hall ticket must be produced at the test center and also in examination hall, failing which he/she will not be allowed to appear for the test. 6. Candidate must carry only (i) writing pad, (ii) Blue/Black ball point pen into the Examination Hall. Use Blue/Black ball point pen only to darken the circle of correct answer in OMR answer sheet. Do not use pencil to darken the circles in OMR answer sheet. 7. Carrying of calculators, log tables, cell phones, any other electronic gadgets and loose paper into the examination hall is strictly prohibited. 8. Adoption of any kind of unfair means at the time of test or any act of impersonation will disqualify the candidate from appearing the test. Hall ticket (except group), the students can write a request letter to the Chief Superintendent by enclosing copies of evidence. 10. The candidates should hand over the OMR answer sheet to the invigilator before leaving the examination hall. They are allowed to take away the question paper booklet after completion of the exam. Note : Details furnished in the application are final. Subsequent requests for corrections will not be entertained for wrong filling of application. Paste the Photo on any white paper and Sign below. Ensure that the signature is within the box. Scan only the photograph along with the signature. Please do not scan the complete page. The entire image consisting of the photo along with the signature is required to be scanned and stored in *.jpg format on local machine. Ensure that the size of the scanned image is not more than 50kb.If the size of the file is more than 50kb, then adjust the settings of the scanner such as the dpi resolution, no. of colours etc., during the process of scanning. Declaration: I hereby declare that I have read the information bulletin before uploading the details. 1. Details furnished in the application are final. Subsequent requests for corrections will not be entertained for wrong filling of application. 2. After filling the form, Click on Preview Button to preview the information filled in the form. Please check it thoroughly, EDIT the form details if needed and then only submit the same. ~ I read the information bulletin of MJPTBCWREIS-2017 and found myself fully eligible as per the criteria mentioned in the bulletin. ~ I declare that the particulars furnished above are true to the best of my knowledge and belief. Before TV9 office, Hyderabad. 040-66720700.